Posted by wallofsound in Music History. Heritage refers to those things that we inherit from the past, often to those things which somehow define or represent us. The idea that we have a popular music heritage – material goods which stand for the past of pop music – has been an emergent idea within museums over the last 20 years. Academics who have studied this phenomenon usually suggest that this represents as change in these institutions, which were originally established to protect our classical heritage, as a desire to take popular culture more seriously, and a commitment to making museums more accessible and relevant to a wider group of people. The notion of popular heritage represents the more substantial shifts in history as an academic study which we examined in chapter one, and a greater emphasis within history on popular experience and memory. It is interesting to see how these connected ideas have informed the development of different forms of museum and archives devoted to popular music. Chapter two briefly touched upon the establishment of the Country Music Hall of Fame and Museum, which clearly demonstrates how ideas of a canon of music greats has been extended to the idea of representing the history of country music in terms of objects representing the music’s heritage. This section briefly discusses four other examples: the short-lived National Centre for Popular Music in Sheffield UK; the EMP Museum in Seattle USA; and examples from a city in the English Midlands, the Home of Metal, Birmingham Music Heritage, and the Birmingham Popular Music Archive. In essence this is an evaluation of two physically-located institutions which celebrate local and national popular music history, with three regionally-based projects, in either a temporary exhibition or a virtual archive, which celebrate the detail of one particular city’s music heritage. In spite of their geographic distance, there are some striking similarities between the National Centre for Popular Music (NCPM) in Sheffield and the Seattle-based Experience Music Project (EMP). They were both established at the turn of the twenty-first century, they were both housed in striking postmodern buildings (the EPM designed by the architect of the Guggenheim museum in Bilbao, Frank Gehry), and both featured state-of-the-art electronic displays and interactive technology to investigate popular music culture. They also both struggled to cover their costs because visitor numbers were so much lower than originally projected. The Sheffield NCPM stayed open little over a year, while the Seattle EMP survives to this day, after many struggles, and in much adapted form. Taking analyses of the NCPM by Tara Brabazon and Stephen Mallinder (2006: 98-103) and of EMP by Chris Bruce (2006) we can start to draw some conclusions about institutions which present music heritage in this form. Brabazon and Mallinder suggest that the NCPM’s failure was in part due to its location and wider problems in establishing a ‘cultural quarter’ to regenerate an area facing the problems of post-industrial decline. Although the nearby northern English city of Bradford had successfully hosted a museum for photography, film and television, Sheffield certainly lacked other attractions in the area, while the EMP was built within an area of Seattle which included existing tourist attractions like the Space Needle. Nevertheless, similar problems in attracting visitors motivated the EMP to reduce the space assigned to music and they added the Science Fiction Museum and Hall of Fame in 2004 to strengthen its appeal. Perhaps even more importantly this change represented a continued commitment of EMP founder and Microsoft co-founder Paul Allen which allowed the building to survive, while the public funder of the NCPM could not provide funds beyond the initial capital investment. The NCPM’s reliance on new technology including a futuristic 3D surround sound auditorium introduced problems of reliability and, as Brabazon and Mallinder, highlight the technology placed an over emphasis on ‘music as a tactile craft’. Although the EMP uses new technology to feature interviews and performance footage, and most recently and ambitiously to play a collection of guitars, its offering is much more that of a traditional museum. Perhaps more importantly the EMP is firmly based upon the city’s connection to rock artists like Jimi Hendrix and Nirvana, and its strong association with grunge, which has been a strong feature of exhibitions within the ‘music experience’. By contrast, while Sheffield has a rich popular music history, and notable local musician Martyn Ware was involved in the development of the centre, Sheffield failed to signify either itself as the centre of a music culture to a large audience, or the obvious home for a national celebration of popular music. Unlike photography, film or television, music is often associated with distinct locales, and while Seattle has been successful at linking itself with a transnational culture of grunge, through Nirvana, and linking grunge to a longer history of rock guitar music symbolised by Hendrix, Sheffield’s scenes have tended to be smaller, and its successful stars have been understood as transnational pop performers. The NCPM’s emphasis in its exhibits and interactve technology on music as a commercial product, rather than a cultural interaction, exacerbated this difficulty further. By comparison, the two case studies from Birmingham take a very different approach. Like Sheffield, Birmingham has a rich music history, but even when artists have become international names their origins in the Birmingham Music scene are not that well known outside the city. The city has been associated with heavy metal, a blues-based version of rock music which rose to popularity in the 1970s, and as the project name suggests Home of Metal tried to capitalise on that connection, making the rhetorical claim to being the genres place of origin. 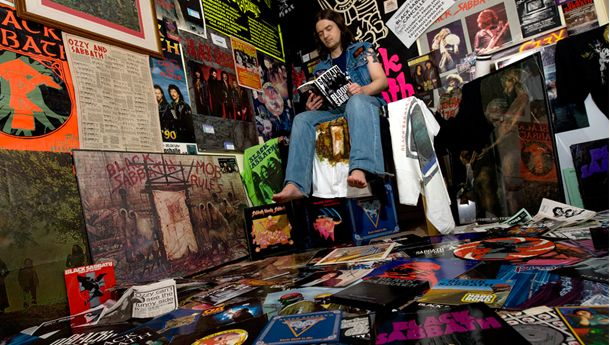 The focus for the project was a public exhibition in one of the City’s galleries exploring “40 years of Heavy Metal and its unique birthplace” which took place in late 211 (http://www.homeofmetal.com/events/events-list/birmingham-museum-art-gallery-home-of-metal/). Built around a huge collection of memorabilia, and strongly linked to the Birmingham-originated band Black Sabbath, the project engaged metal fans and the musicians to generate exhibition content, and reproduced much of the visual iconography of metal culture. The strength of the project was the simplicity of the concept, which attendees clearly strongly associated, and the diverse way in which the story was told and engaged visitors. In comparison to the NCPM and EMP, the Home of Metal was relatively simple, and as it used an existing gallery for a temporary exhibition, it was far less costly in financial terms. The exhibition tied a relatively well-known story to the commitment of fans, their memories and keepsakes, and some regional promotion activity. It is easy to trace the ideas of disruption, margins and mainstream and roots within the exhibition, and many of the core narratives which people use to make sense of metal were presented rather than explored. For instance, the idea that metal reproduced the sound of the Midlands’ heavy industry (rather than their love of black American blues forms) is given prominence. The exhibition was, though, far more open than the narratives of television documentaries, and far richer than, say, the BBC’s Metal Britannia programme. Birmingham also has a number of online archives, which aim to assert Birmingham’s importance in national and international popular music. The Home of Metal has continued as an online experience, and encourages continued contributions from fans. The Birmingham Music Archive (http://birminghammusicarchive.com) and Birmingham Music Heritage (http://www.birminghammusicheritage.org.uk) are both broader and even more rooted in the idea of music heritage and culture. The archive’s strap line is ‘Celebrating Birmingham’s Popular Music History’, and it offers a breadth of information and personal comment on past scenes that embrace over 200 bands and artists, tens of clubs and live venues and local recordings studios, radio stations and record shops. The emphasis is on attracting contributions and comments from music fans and these is no totalising narrative beyond the idea of a participatory culture. Fans themselves, though, do tend to use ideas of disruption in their accounts, and the idea of scenes growing from the margins into the mainstream is common. The Heritage site focuses on “untold stories” presented in a basic information format of text, iconic images and video interviews. All these examples of music heritage share the idea of a localised, but global music culture, but each has presented and investigated it in different ways. In comparison to the television structures, all of the institutions discussed here try and engage music fans, but they all tend to very traditional stories of pop’s past. Perhaps what is most interesting about the phonomena of music heritage is the extent to which it takes popular music seriously, and the very different ways in which it is utilised for other purposes. Celebration, promotion, regeneration, engagement and storytelling pull in different directions, and the enterprises seem more successful when their scale is manageable, their focus local and their engagement with fans strongest.